When I started this series of posts covering all the new aquisitions for each region, I actually had a completely different list of new wines for France but due to the fact that we’ve turned the section over pretty quickly, I’m featuring a whole new lineup for the country. This week I’d like to shine the spotlight on a few new wines from the Loire Valley – a couple new and exiting french Sauvignon Blancs that we recently brought in as well as a bright and fresh Chenin Blanc and then cover a new wine to our shelves from Beaujolais. Next week, I’ll focus on the new Burgundy and Bordeaux. Perhaps no wine is more divisive than Sauvignon Blanc. It seems like people either love it or hate it and it’s exactly for this reason that you don’t often see it poured at weddings or public events. There are always safer options for catering to large groups of people. Pinot Grigio anyone? The main popular expressions the grape can be neatly broken down into 4 categories: Loire Valley, Bordeaux, California, and New Zealand. Granted, you could argue that we’re missing Friuli, Alto Adige, Chile, or even South Africa but, well, since I’m in the driver’s seat, I’m leaving those off my “popular expressions” list, at least for today. If we were to broadly describe the Sauvie B’s from the four regions I listed, I’d propose that California Sauvignon Blancs tend to be riper, fuller, higher in alcohol and sometimes see some oak (Fumé Blancs) in contrast to the more tropical, grassy, and catty Sauvignon Blancs from New Zealand. Bordeaux Blancs can also see oak but their expression is often bolder and a bit more waxy due to the addition of Semillon to the blend and they can have an earthy kind of cheese rind component as well. Sauvignon Blancs from the Loire are often defined as flinty or minerally, especially those hailing from Pouilly Fume or Sancerre. The Sauvignon Blancs that we recently brought into the shop however, test that perception of the Loire Valley and are incredibly interesting for anyone who takes Sauvignon Blanc seriously. Denis Jamain Les Fossiles Reuilly, 2016 $23.99 – A couple weeks ago, we were fortunate to have in the shop a group of winemakers which produce fantastic wines that are imported by Kermit Lynch. Denis Jamain one of the three producers that vivisted us and is located in Reuilly, an up-and-coming region in the central-eastern Loire that is gaining attention as a premier Sauvignon Blanc producing appellation. 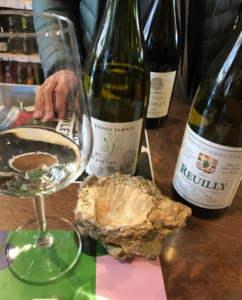 When Jamain came to the shop, he brought with him the rock you see in the image above and it was a great punctuation to the minerality and salinity of the wine. Hopeyfully you can gather from the picture that the soil at his domaine is an ancient sea floor littered with fossilized seashells. As Kermit Lynch says on his website about this wine, “imagine Sancerre grown at Chablis” and I couldn’t agree more. This wine also sees a bit extra skin contact which adds a beautiful and welcomed textural dimension to the wine. This wine is also biodynamic. Domaine Riffault Les Quarterons Sancerre, 2014 $36.99 – We brought this wine in knowing full well that this isn’t a wine for everyone. We actually had the rep leave the tasting bottle behind so that some of the people on our staff could taste it so that they wouldn’t unknowingly sell this to someone looking for a traditional Sancerre. This is a natural, unfined and unfiltered wine. This cuvee sees a minimal dose of SO2 at bottling but all of his others are bottled “au naturel.” Riffault does not harvest his grapes when his neighbors do, he waits, and then waits a bit longer. By the time he picks, Botrytis has set in and the wilted grapes are then fermented to dryness, aged on their lees, and undergo full malo-lactic fermentation. The flavors are rich and deep, full of earthy expressions, ginger, and tropical fruit. This is an interesting and exciting wine and if you are looking to drink something new, this is pretty daring stuff, delicious but daring. Bernard Baudry Chinon Blanc, 2017 $29.99 – Bernard Baudry is one of my favorite Chinon producers. His wines made from the Cabernet Franc grape are vibrant, bright, but also brambly and manage an herbaceous without crossing too far over into the green pepper territory which is so common with wines from this region. At about $20 a bottle for his Les Granges Chinon, it offers incredible value at that price and is commonly recommended by our staff. We were surprised to find out that he makes a Chenin Blanc. Baudry’s Chinon Blanc is a mineral driven wine, organically farmed and fermented dry. It offers a bouquet of wet stones, flowers, and lemon zest framed by bright, fresh acidity. It’s an inviting wine made from a young producer with whom we should all be familiar. Clos de la Roillette Fleurie, 2017 $26.99 – To be completely blunt, I’d say that at this moment, at this price point, this is one of my favorite wines in the shop. I’d like to see what this Beaujolais will be like in another 5-10 years if not more. The wine somehow seems wrapped up in potential while still managing to offer so much at this point in its life. It is both structured and floral and fruity but also expresses almost a Northern Rhone-like earthy-meaty-spiciness. The vineyard from which this wine hailed is on the Fleurie-side of the appellation’s border with Moulin-a-Vent. The soil in this pocket of Fleurie is rich in manganese and clay which allows the wine to develop some great structure and acidity as those soil types tend to lengthen the ripening time. This is a producer which I look forward to following over the coming years.